Properties have a number of methods associated with them automatically. These methods are not inherited via standard inheritance. Rather, they use a special property behavior mechanism to generate a series of methods for each property. The %Property class, which provides certain built-in behavior, such as Get(), Set(), and validation code. 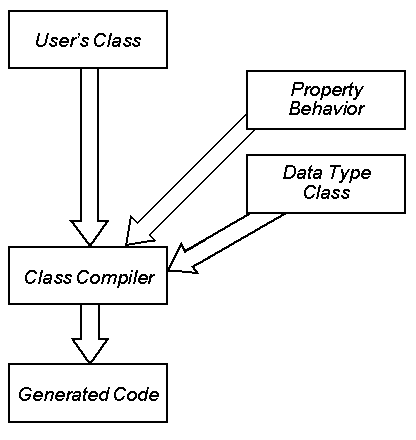 The data type class used by the property, if applicable. Many of these methods are method generators. The property behavior classes are system classes. You cannot specify or modify property behavior. where IsValid() is a method of the property class and LogicalToDisplay() is a method of the %Date data type class. In most cases, you cannot see the actual PropGet() and PropSet() methods; access for simple properties is implemented directly within the InterSystems IRIS virtual machine for optimal performance. You can, however, provide PropGet() and PropSet() methods for a specific property, as long as that property is not object-typed or multidimensional. If you define these methods, the system automatically invokes them at runtime. The following sections describe how to define these accessor methods. Within the custom methods, you can perform any special processing that your application requires. Note that the last screen of the New Property Wizard in Studio provides options for creating a custom Get() method, Set(), or both. If you use these options, Studio defines stub methods with suitable signatures. where car is the OREF of the Car object and PersonId is the ID of the saved Person object. GetObject()  Gets the OID associated with the property. For a property named prop, the method name is propGetObject(). GetObjectId()  Gets the ID associated with the property. For a property named prop, the method name is propGetObjectId(). SetObject()  Sets the OID associated with the property. For a property named prop, the method name is propSetObject(). SetObjectId()  Sets the ID associated with the property. For a property named prop, the method name is propSetObjectId(). It must have the name PropertyNameGet, where PropertyName is the name of the corresponding property. Its return type must be the same as the type of the property. It must return the value of the property. To refer to the value of this property, this method must use the variable i%PropertyName. This name is case-sensitive. Within this getter method for a given property, do not use ..PropertyName syntax to refer to the value of that property. If you attempt to do so, the result is a <FRAMESTACK> error, caused by a recursive series of references. You can, however, use ..PropertyName to refer to other properties, because doing so does not cause any recursion. Note that it is not supported to override accessor methods for object-typed properties or for multidimensional properties. Also because the maximum length of a method name is 220 characters, it is not possible to create accessor methods for properties that are 218, 219, or 220 characters long. It must have the name PropertyNameSet, where PropertyName is the name of the corresponding property. It takes one argument, which contains the value of the property. Specifically, this is the value specified in the SET command, when the property is being set. It must return a %Status value. To set the value of this property, this method must set the variable i%PropertyName. This name is case-sensitive. Within this setter method for a given property, do not use ..PropertyName syntax to refer to the value of that property. If you attempt to do so, the result is a <FRAMESTACK> error, caused by a recursive series of references. You can, however, use ..PropertyName to refer to other properties, because doing so does not cause any recursion. Notice that this example refers to the Namespaces property of the same object by using the ..PropertyName syntax. This usage is not an error, because it does not cause any recursion. As noted earlier, it is not supported to override accessor methods for object-typed properties. If you need to define a property that holds object values and you need to define custom accessor methods, define the property with the type %RawString.. This is not an object class but is rather a generic class, and it is permitted to override the accessor methods for this property. When using the property, set it equal to an instance of the desired class. For example, the following class includes the property Zip, whose formal type is %RawString. The property description indicates that the property is meant to be an instance of Sample.USZipCode. The class also defines the ZipGet() and ZipSet() property methods. /// When setting this property, set it equal to instance of Sample.USZipCode. /// to override ZipGet() and ZipSet().